Giuseppi Verdi (1813-1901) Verdi was a dominant force in the world of Italian opera throughout the much of 19th century. By the mid-1850s his operas, including Rigoletto, Il Trovatore and La Traviata had made him internationally famous. All together he composed 32 operas, many of which hold prime of place in the world of opera today. 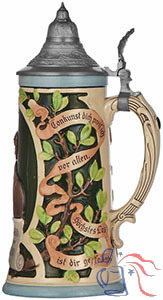 Fifth in a series of five composer steins, with Nos. 711, 712, 713 and 714.